Forward Andrei Kostitsyn will miss Belarus’ next game of the 2014 Ice Hockey World Championship against Kazakhstan scheduled for May 11th. With just 5:38 left in the opening game of the tournament against Team USA, Kostitsyn approached U.S. player Kevin Donovan from behind and delivered a two-handed cross-check to the head and neck area. Kostitsyn was assessed a two-minute penalty for cross-checking on the play. However, that wouldn’t be the only punishment Kostistyn received aside from his team dropping the opening game by a disappointing score of 6-1 to the Americans. The Disciplinary Panel reviewed his cross-check and had a hearing with Kostitsyn immediately following the game. 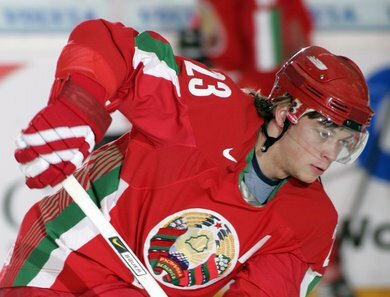 The panel determined that Kostitsyn’s action was not only careless but also endangered the safety of Kevin Donovan and gave a one-game suspension to the Belarusian forward.